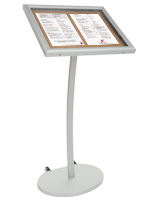 Does your establishment need floor standing sign holders to advertise offers or display promotional signage? 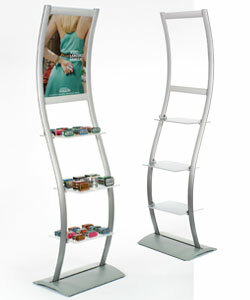 These acrylic, plastic, metal or aluminum freestanding store fixtures are perfect for many uses. The silver or black floor standing sign holders come in sizes that will hold large format graphics or may be designed to display signage that is smaller. The bases of the frames may be in the shape of a pedestal or shovel so that they can be placed next to or directly into showroom exhibits. 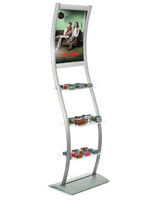 The floor standing sign holders, like retail poster stands, are sometimes height adjustable to be able to accommodate displays of different size. There are even some mounts that will allow you to choose a whiteboard insert that allows for the fixture to be instantly turned into a write-on surface. 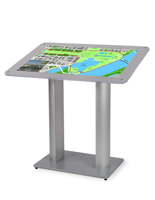 What other notable features are present with the pedestal stands and poster mounts? 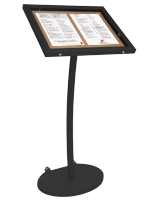 These floor standing sign holders have are made of durable materials, like acrylic, metal, or aluminum. Different bases are present on some of the poster stands so that materials for sale can be placed directly on the bottom of the store fixture. The sign holders feature frames that may snap open or closed, have top insert graphics or have side insert images because of a fold over design. There are some floor standing sign frames that use screw caps to attach larger posters to black or silver bases. These frames may be shaped like a wave, have shelves for merchandise or even wheels to make them mobile. There are store fixtures that use clear acrylic lenses to house special offer signage or wet erase boards to create custom messages that can be easily erased. These displays are able to hold advertising that comes in a variety of sizes, including 7” x 5.5” posters up to 30” x 80” graphics. Some of the freestanding sign holders are even on height adjustable pedestals or poles that can be set somewhere between 20” high and 38” high to offer several viewing heights. 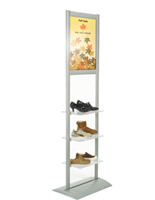 Many retail businesses would benefit from using pedestal stands and other floor standing sign frames. 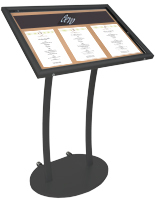 Establishments that use point of sale displays can easily place one of these store fixtures near clothing for various merchandising purposes. With the adjustable posts and varying sizes of graphics, the poster stands are ideal marketing tools for promoting clearance merchandise, special offers, new arrivals, or overstock sales. The acrylic and metal frames are often seen in boutiques as well as malls, food service institutions and business lobbies. 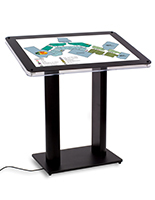 The pedestal stands and retail display mounts are great information tools in hotels, banks, and college campuses. No matter if you choose a black, clear, silver or red frame, the freestanding store fixtures are easily noticed by customers.